Options, because we are all unique. One standard we maintain, and are continually seeking to improve is the LOCAL standard. 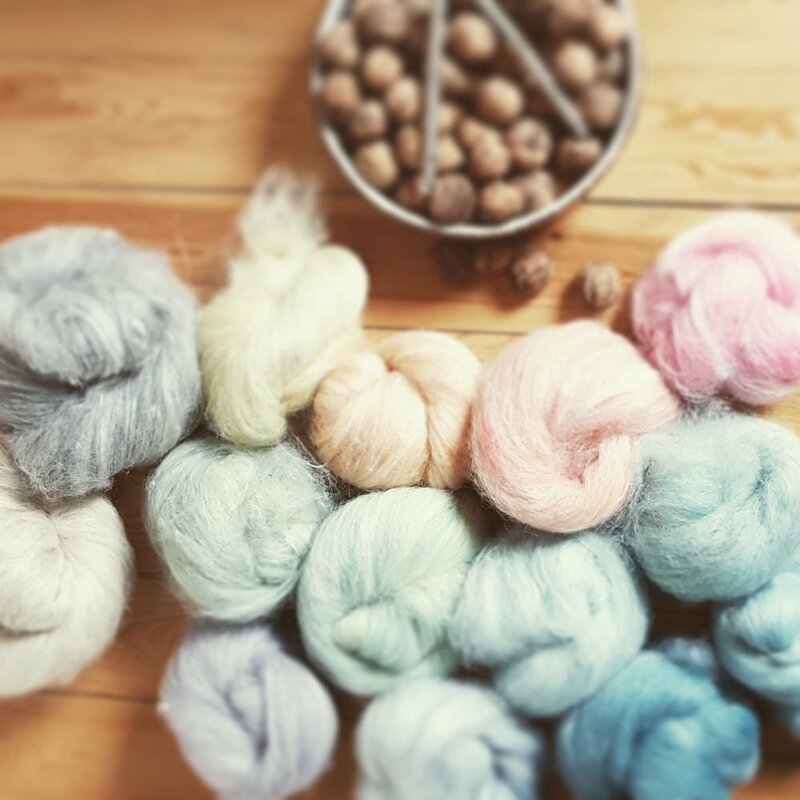 As of 2019 we are proud to announce that be the Fall of 2019, 100% of yarns used in our hand woven goods, and hand dyed/hand spun yarns will be from will be locally sourced (Greater Region) fibers. These can include Est de Laine Merino, South German Merino, Alpaca, Jacob, Wensleydale and Gotland wools. For the Local Lahuro yarns that will be arriving Fall 2019, the process starts with a spring shearing and visits to our supply farms and mills. We go to the farm and help skirt and pack the wool. the wool is then sent to be washed and carded. The carded wool is then divided, to be sent either back to our studio for spinning and dying or to be sent to another mill for spinning. Understanding how different fibers respond to the process of spinning and suitability to high or low levels of wear, provides a foundation for the weight and patterns/ projects we recommend for our yarns. and ‘Hazel Grouse’ will be 25% Alpaca and 75% Est de Laine Merino. Our chunkiest spin - Jacob, Texel, Gotland and Est de Laine Merino is used for our larger home textiles. The sizes and blends in this collection change based on the quality and availability of the fibers. The second line is ‘Oesling’. This line will eventually contains 2 handspun bases: ‘Knieff’ and ‘Our Valley’ The first of these is spun from Est de Laine Merino roving, and the second is a blend of Est de Laine Merino and Local Alpaca. The third line is a ‘Breed Study’ opportunity. Each year we will choose a different breed to work with and offer handspun yarns and projects that highlight it’s qualities. These fibers will not always be local and they will be produced in very small batches so, first come first served!